Lobsta, lobsta! Just because fall has arrived doesn’t mean you can’t eek out the last few days of warm weather with the summer time crustacean. A few weeks ago, a group of my friends got together for a lobster dinner in celebration of our friend Dave’s birthday. 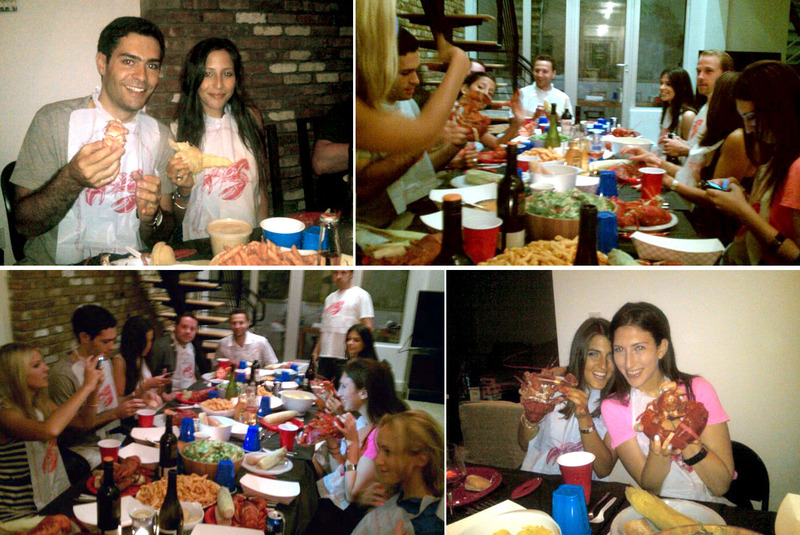 14 people, 14 lobsters (all cooked by me!) and all the sides and fixings. The evening was fun, casual and a great way to do a meal with friends. The Lobster Place in Chelsea Market provided our main ingredient. You want to pick up the live guys as close to dinner time as possible so plan accordingly. After you do pick them up, be sure to keep the lobsters in cold running salt water to keep them alive. The Lobster Place also sells bibs and crackers making it an easy one stop shop. They even have take out containers for the shells if you want to go all out Cape Cod. Can’t make it to the Lobster place? Bed Bath and Beyond has all your necessary lobster accouterments as well including lobster claw crackers (see ours on the table!) and butter warmers. Pour 1 gallon of water into a 16-quart stock pot over medium heat. Tie the thyme, parsley and bay leaves together with kitchen string to make a bouquet garni. Place the herb bundle in the stock pot and secure the end of the string to the pot handle for easy removal. Cut the lemon in half and squeeze the juice into the water, then drop in the lemons. Add wine, peppercorns and sea salt. Bring to a rolling boil. With the rubber bands still securing the claws, plunge lobsters head first into the stock pot, cover, and boil for 15 minutes. The lobster shells will be red and the tails will curl up when done. Remove lobsters from boiling liquid with tongs. While the lobsters are boiling, melt the butter over medium heat in a small sauce pan until melted and smooth. Ladle out the butter and place in a warm cup until the lobster is done.